The folks that faithfully bring you "This Week in Pennsylvania Archaeology" every Friday are spending the holidays with friends and family. From all of us to all of our readers, we hope you had a very Merry Christmas, and will have a Happy New Year! Next stop, the 2014 Pennsylvania Farm Show! This week in Pennsylvania Archaeology takes us to Washington County located in the southwestern corner of Pennsylvania. Washington County is bordered by the Monongahela River on the east, Greene County to the South, West Virginia state border on the west and Beaver and Allegheny counties on the north. On March 28, 1781 Washington County was formed from part of Westmoreland County. It was named after our American Revolutionary War leader and father of our country, George Washington. The county contains 861 square miles and its seat is Washington, Pennsylvania. The physiography and geology of Washington County is shared by many of the surrounding counties in southwestern Pennsylvania and West Virginia. Washington County is in the Waynesburg Hills Section and the Pittsburgh Low Plateau Section of the Appalachian Plateaus Province which consists of Permian and Pennsylvanian geologic periods (250-330 million years old). Much of the bedrock geology is comprised of shales, limestones and sandstones of various types. Some of the largest soft coal deposits underlay these formations and are economically important to much of southwestern Pennsylvania. The Monongahela River, with its many locks and dams, is used to barge the coal down river to Pittsburgh and beyond. The general topography of Washington County is characterized by gently rolling hills on its eastern half and , for the most part, rugged hills on its western half where the terrain consists of dissected valleys and somewhat narrow floodplains. With the exception of a small area on the west and an equally sized area on the north that drains to the main Ohio River, the creeks flow eastward to the Monongahela River which joins the Ohio River system at Pittsburgh. There, the principal watercourses include Ten Mile, Pigeon and Chartiers Creeks, the latter of which is the largest. Chartiers Creek, named after Peter Chartiers, whose mother was likely Shawnee, had a trading post on or near the mouth of Chartiers Creek at present day McKees Rocks. Peter who sided with the French and their Indian allies on the Ohio frontier was also a fur trader and Indian-White interpreter during that period of political turmoil in the Ohio valley. During the 18th century there were three notable Indian paths that ran through Washington County, all of which intersected at Washington, Pennsylvania and connected with other pathways along all four cardinal points of the compass. The Catfish Path was so-named after the Delaware Indian, Tingoocque (translated as) “Catfish” (Wallace 1965). The path ran north along Chartier’s Creek and joined with other Indian paths at the Delaware town of Shannopin (Donehoo 1928) at present day Pittsburgh. South of Washington the path crossed both branches of Ten Mile Creek then on to join the Warriors Branch Path near present day Waynesburg, Pennsylvania. The Glades Path joined with the Ohio River at present day Wheeling , West Virginia and extended eastward to the Raystown at present day Bedford, Pennsylvania. Traveling the path required one to ford the Youghiogheny River at West Newton, Pennsylvania. Other lesser waterways and mountains would have been encountered on the way between present day Somerset and the Juniata’s Raystown Branch. A 1797 entry in John Heckwelder’s journal states that “ this road [Glades Indian path] is said to be best in summer during dry weather, when both Mountains are also easy of ascent” (Wallace 1965). 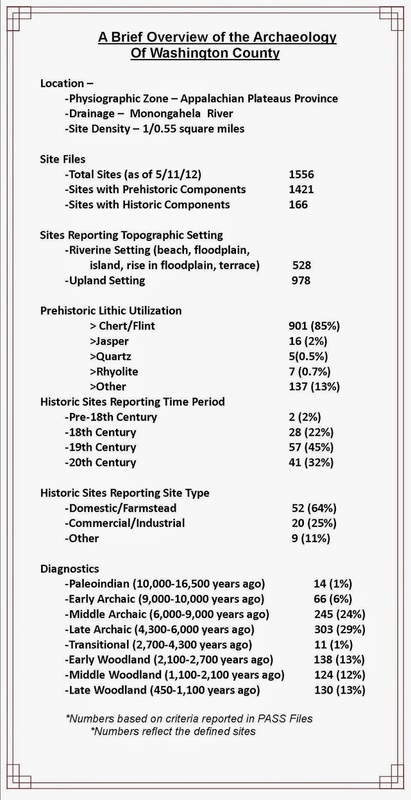 The Pennsylvania Archaeological Survey (PASS) files lists 1421 prehistoric and 166 historic sites bringing the total to 1556 recorded sites for Washington County. This is a rather high site density of one site for every .55 miles. A review of the list shows that 2/3rds of the sites are located in upland settings as opposed to lowland (i.e. floodplain, terrace, island etc.) settings. Most of the upland settings are hilltops, benches and saddles (low points between two higher points). 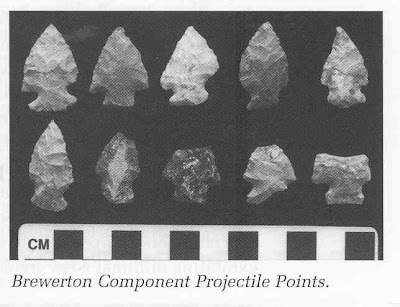 Cherts of various types were the preferred lithic material used by prehistoric peoples living in the pre-Washington County area. Not surprising, the dominant cultural stages based on projectile point types present at these sites characterized the Late and Middle Archaic periods (4,300-9,000 years ago). 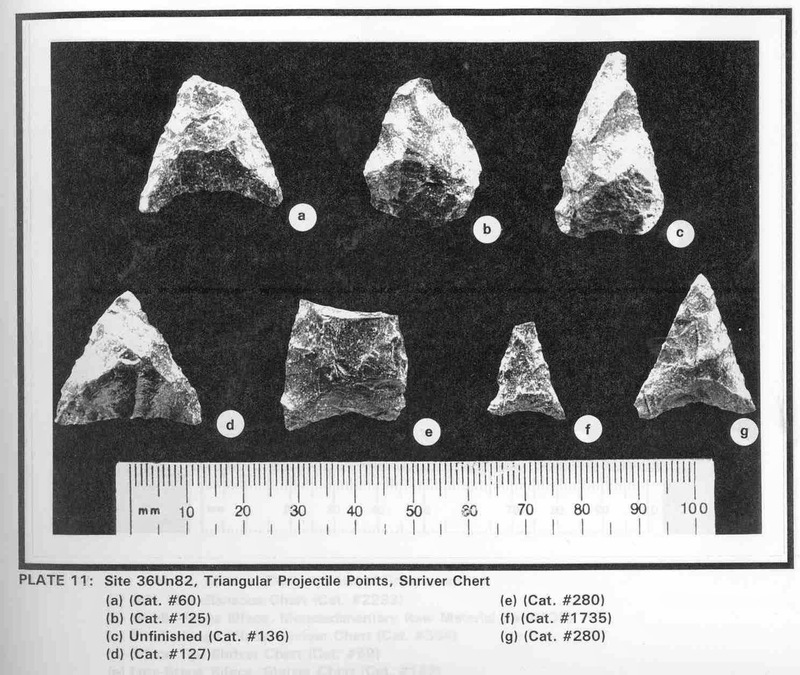 Projectile points representative of the Early, Middle and Late Woodland periods followed these next in number. The Transitional and Paleoindian periods are last with 11 and 14 recorded sites, respectively. Historic period sites are few in number when comparisons are made with the number of recorded prehistoric sites. Only 81 sites indicative of this period are known and largely include domestic/farmsteads and commercial/industrial component sites. Whatever the reason(s) the emphasis to report sites has been focused on reporting prehistoric sites of the foregoing eight recognized cultural periods. The region in and around Washington County has been of interest to antiquarians and archaeologists for many decades past. George Fisher, an amateur archaeologist and collector from Finleyville, Pennsylvania single handedly located and investigated a large number of prehistoric sites dating to the Woodland period (2100 - 450 years ago). The notes and photographs that survive chronicle an active period in his site investigation career from the 1920’s through the 1940’s largely based on Monongahela villages in the southwestern Pennsylvania region. 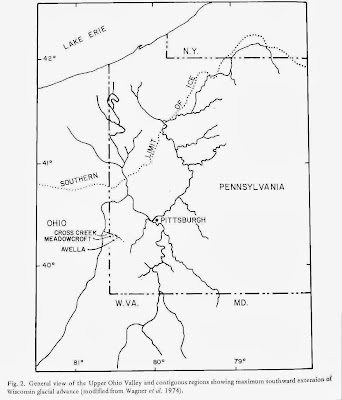 Fisher was especially active in many parts of Allegheny, Washington, Westmoreland and Fayette counties south of Pittsburgh and his report to the Pennsylvania Archaeologist illustrates these activities (Fisher 1930). 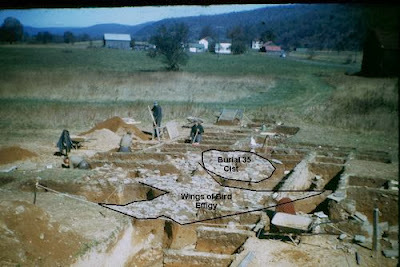 In 1973, a team of specialists from the University of Pittsburgh led by James Adovasio commenced excavations at the Meadowcroft Rockshelter located near the small village of Avella, Washington County. Meadowcroft is a dry rockshelter formed from part of a large sandstone cliff of Morgantown-Connellsville sandstone.It is a smaller part of the larger Casselman Formation typical to Washington County’s Cross Creek drainage. The contents of the rockshelter were sealed over many thousands of years by the down slope movement of colluvial sediments. These sediments sealed an incredible cultural record dating back to approximately 16,000 years ago (cf. Adovasio et.al. 1975; 1977). Over subsequent years, the team of specialists uncovered a multi-layered sequence of intact cultural deposits dating from the pre-Clovis through Historic periods which qualified the site as one of the most continually occupied archaeological records in North America. Meadowcroft Rockshelter was deemed so important that it was recognized worldwide and listed as a National Historic Landmark and World Heritage Site. Meadowcroft Rockshelter is the main feature of interest at Meadowcroft Village where the public can visit the rockshelter through guided tours. We hope that you have enjoyed this journey to Washington County archaeology and encourage you to read additional information provided in the Reference section of this presentation. Do join us again next week when we will celebrate the Christmas season with more interesting archaeology facts! 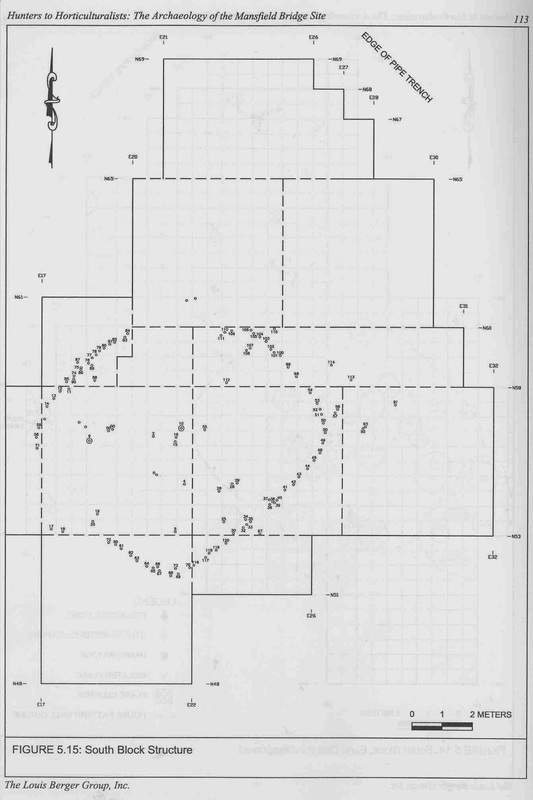 1975 Excavations at Meadowcroft Rockshelter, 1973-1974: A Progress Report. 1977 Meadowcroft Rockshelter: Retrospect 1976. Pennsylvania Archaeologist 47(2-3):1-93. 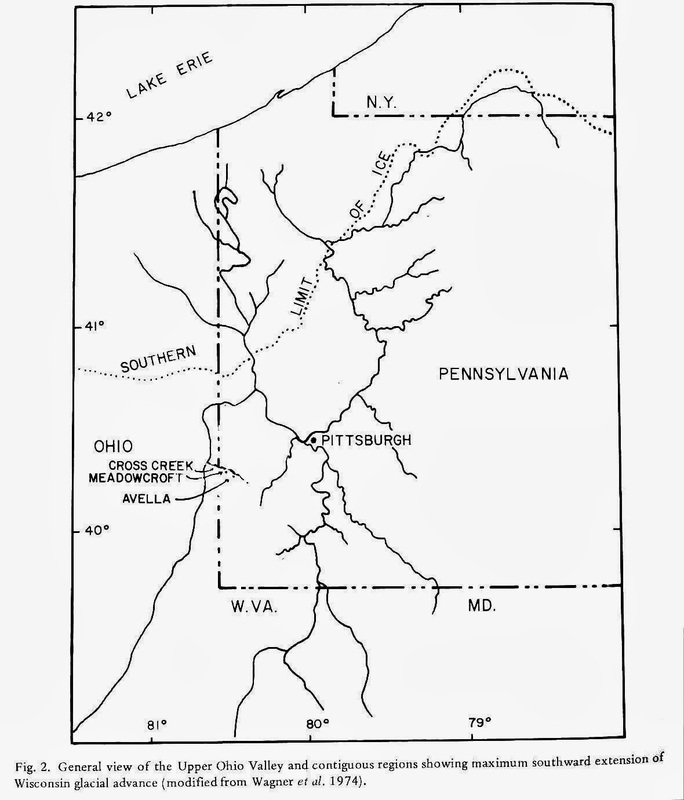 1930 Indian Sites and Excavations in Western Pennsylvania. 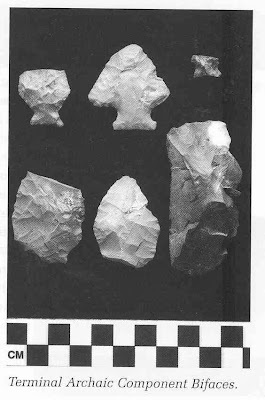 Pennsylvania Archaeologist 1(2):8-9. 1965 Indian Paths of Pennsylvania. Pennsylvania Historical and Museum Commission. Harrisburg. This week’s journey by county through the archaeology of Pennsylvania takes us to northwestern Pennsylvania and Warren County. This county is situated in the High Plateau section and the Northwestern Glaciated section of the Appalachian Plateaus Physiographic Province. The region is characterized by rolling uplands and steep valleys. The northwestern half of the county was glaciated and exhibits glacial features such as terminal moraines, kettle lakes, swamps and kame terraces. The Allegheny River cuts through the middle of the county and the major tributaries are Brokenstraw Creek and Conewango Creek. 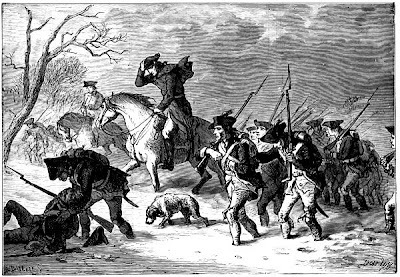 Warren County was first occupied by Europeans in the 1740s. Initially, the French claimed the region and documented their claim with a series of lead plates buried in the ground that stretched from the City of Warren down the Mississippi Valley. After the French and Indian War, the British took over and finally the Americans incorporated the land into the Commonwealth of Pennsylvania. 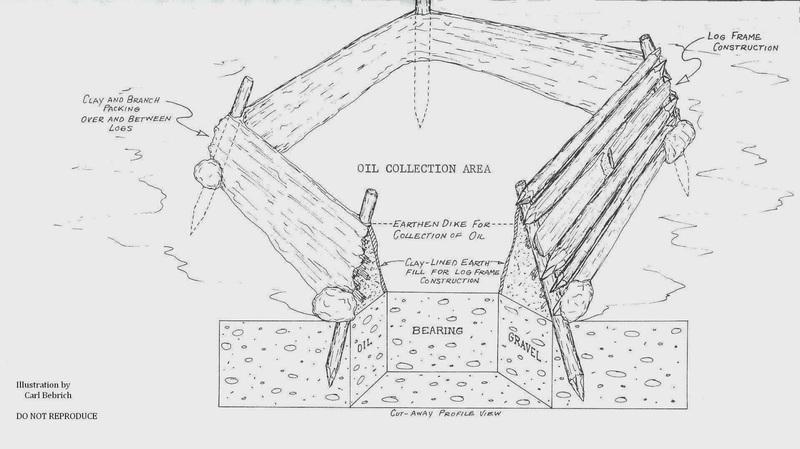 Early on, the major industry was lumber but the discovery of oil in the 1870’s replaced the logging industry. Residents of the county prospered in the 19th century but by the middle of the 20th century the economy was on the decline. A large section of Warren County is in the Allegheny National Forest and is reserved for recreation, lumbering and the gas industry. The density of sites (at 1 site per 1.97 square miles) is relatively high especially compared to other counties in the northern part of the Commonwealth. There are concentrations of prehistoric sites along the Allegheny River, at the mouth of the Brokenstraw for example, but numerous sites have also been recorded in the uplands. Many of these are rockshelters and 28% of all sites in the county fit this category. Allegheny National Forest has their own crew of archaeologists and while conducting surveys in preparation for logging and gas projects, they have recorded many of these sites. 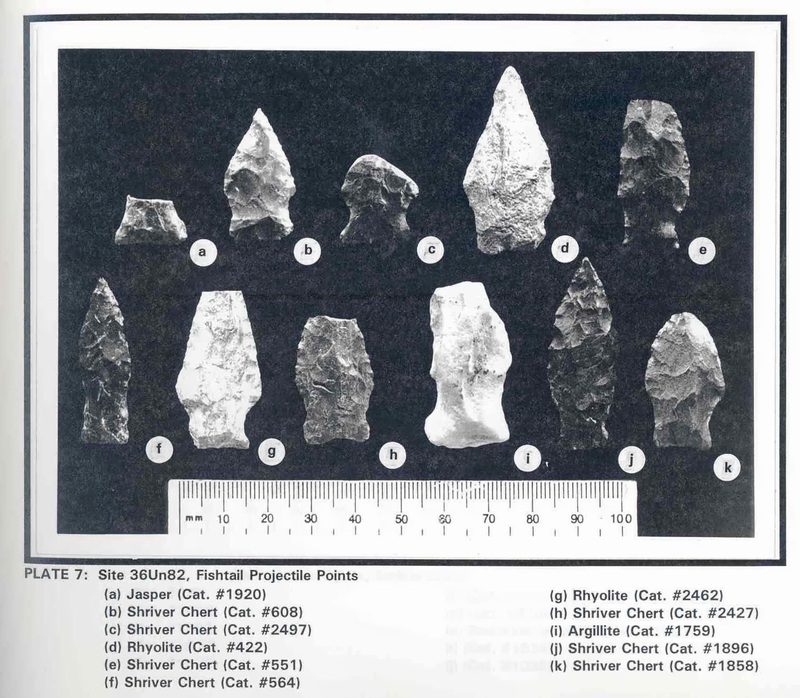 The most commonly used lithic material by prehistoric peoples in making stone tools is chert (43%) and 42% of the sites reporting lithic material specify Onondaga chert. The Onondaga formation is located in a band extending from Ontario across New York State approximately 100 miles (160 km) to the north. This is a high quality and distinctive lithic type that was used throughout prehistory. It is assumed that Native Americans directly procured this chert from bedrock sources but there is also ample evidence that they used pebbles and cobbles that were washed into the region by rivers or pushed into the region by the glaciers. Although the Allegheny National Forest archaeologists have conducted the most extensive surveys in the county, there have been several other major surveys. The regional archaeological survey program which was conducted between 1979 and 1981 included Warren County and documented many new sites but was especially productive in updating information on existing sites. For example the complex of sites known as the Buckaloons was proposed as a National Register Historic District but has yet to be nominated. This track of land contains several sites at the mouth of the Brokenstraw Creek that include occupations from small Paleoindian camps to Late Prehistoric villages and several Hopewell mounds. 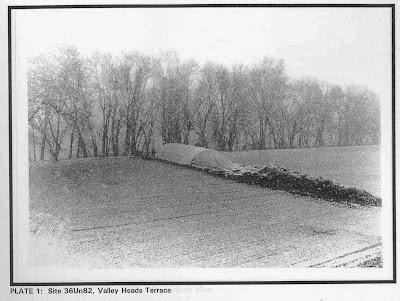 Warren County contains at least eight burial mounds dating to the Middle Woodland period and several of these were tested in 1941 by the Pennsylvania Historical Commission under the direction of Edmund S. Carpenter and Wesley Bliss. This was part of the Civilian Conservation Corps (CCC) investigation of mound and village sites in northwestern Pennsylvania. Interestingly, the excavation of the Sugar Run Mound was conducted by a crew of Seneca Indians from the Allegheny Reservation. 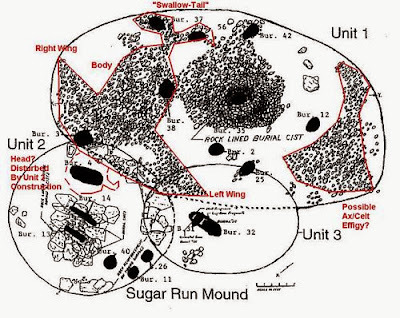 The Sugar Run Mound site (36Wa359) contained three mounds that slightly overlapped each other. Although these had been plowed down to almost level with the current ground surface, it was possible to determine the construction sequence of the three. There were at least three stone lined crypts, each surrounded by a cobble pavement. It is believed that the cobbles under Mound Unit #1 were arranged in the shape of a raptorial bird on one side of the stone lined crypt and in the shape of a celt on the other side. According to McConaughy and Johnson (2003:114), the three mounds are separated by relatively short time intervals. 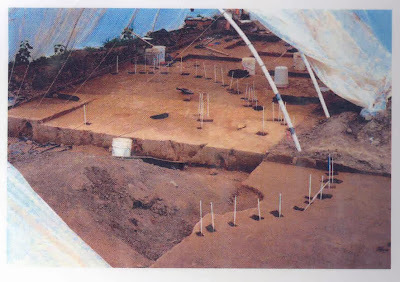 Based on the low frequency of exotic trade artifacts and the radiocarbon date of AD 250 (uncorrected) Mound Unit #1 was the first to be constructed but this was prior to the local population becoming involved in the Hopewell Interaction Sphere trade network. Mounds #2 and #3 contained numerous exotic trade artifacts such as mica, galena, marine shell, copper and Flint Ridge chalcedony, indicating these mounds date later in time when the local population was actively involved in the Hopewell Interaction Sphere. According to McConaughy and Johnson (2003:114, Sugar Run Mound is part of the Squawkie Hill phase, a local manifestation of Hopewell. This is found at several mounds in northwestern Pennsylvania notably Nelson (36Cw58), Irvine (36Wa251-255), Cornplanter (36Wa242) and Corydon (36Wa1). Finally, Warren County is the location of the last Indian controlled track of land in Pennsylvania. This was known as the Cornplanter Grant. Cornplanter was a Seneca chief who fought against the United State during the Revolutionary War. However, after the war, he encouraged peace with the United States. 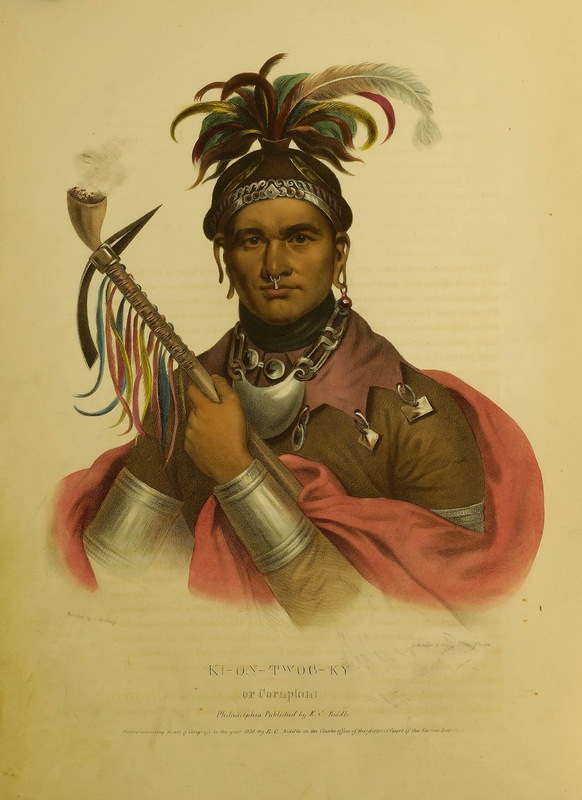 According to Wallace (1999:167), he was instrumental in keeping the Iroquois out of the Miami confederacy which defeated two American armies but was eventually routed by Anthony Wayne at the Battle of Fallen Timbers in 1794. In response to his peace keeping efforts, Pennsylvania awarded Cornplanter and his heirs “in perpetuity” 600 acres of land in the Upper Allegheny Valley just south of the New York state border. This included his town of Jenuchshadego. Initially, Cornplanter “brought in Quaker teachers, established schools, made roads, built good houses, encouraged agriculture, bred large herds of cattle and, in a word, turned the Cornplanter Grant into a model community” (Wallace 1999:168). Unfortunately, at the end of his life, he rejected all of this becoming disillusioned with his non-Indian neighbors. He died in 1836. The Cornplanter Grant was occupied by his descendents and other Indians until 1964, when the remaining residents were relocated upriver in preparation for the construction of the Kinzua Dam. Cornplanter’s cemetery was archaeologically excavated (Abrams 1965 and Sublett 1965) and, along with his monument also re-located. Remembering the words of the original land grant issued by the Commonwealth “in perpetuity”, the dam project was strongly opposed by Native Americans; however, the land was flooded in 1967. This signaled the beginning of a revitalization of Native American culture in America; an event that was instrumental in the formation of the American Indian Movement. The flooding also covered numerous archaeological sites including the Sugar Run mound discussed above. We hope you have found this journey through the archaeological heritage of Warren County interesting, and that you will seek additional reading in the references provided below. Understanding and exploring our archaeological heritage is crucial to our understanding of human behavior and our ability to change and adapt over time - just as the peoples of Warren County have done for thousands of years. 1965 The Cornplanter Cemetery. Pennsylvania Archaeologist 35(2):59-73. Woodland Periods in Pennsylvania, edited by Paul Raber and Verna Cowin, pp. 101-116. Recent Research in Pennsylvania Number 3, Pennsylvania Historical and Museum Commission, Harrisburg, Pennsylvania. 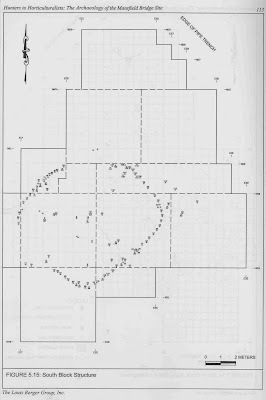 1965 The Cornplanter Cemetery: Skeletal Analysis. Pennsylvania Archaeologist 35(2):74-91. 1999 Indians in Pennsylvania. Anthropological Series Number 5. Pennsylvania Historical and Museum Commission, Harrisburg. We return this week to our county by county journey through Pennsylvania’s archaeological heritage with a stop in the northwestern corner of the state, Venango County. Situated in the glaciated Appalachian Plateaus Province this physiographic zone contains some of the highest elevations in Pennsylvania. Today the primary drainage is the Allegheny River, but during Pleistocene glaciations most of the streams and rivers drained northward into Lake Erie and then into the Atlantic Ocean via the St. Lawrence Seaway. Ice dams which formed during the Pleistocene reversed the direction of the major drainages forcing the directional flow south into the Allegheny River, and the Ohio River drainage basin. Glacial till contains gravels of Onondaga chert cobbles, transported from the quarries of western New York. 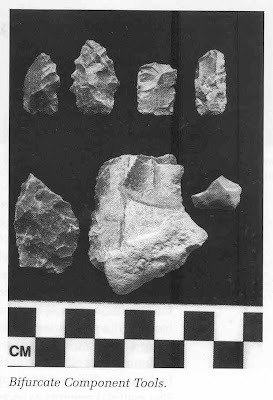 The primary lithic material used for stone tool production in Venango County is chert and there are several local sources in addition to the high quality Onondaga material. Northwestern Pennsylvania typically receives major snow fall from the west and cold air masses out of Canada insure temperatures to retain snow cover for an average of 60 days per year. 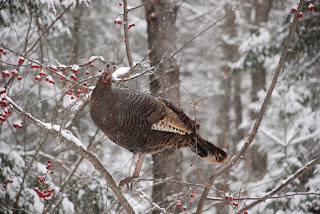 Forests of oak, maple, pine and hickory provided prehistoric peoples with food sources from nuts and seeds to the fauna that inhabited these woods. Four prehistoric settlement types have been defined for Venango County; rock shelters, riverine, upland and special purpose sites. 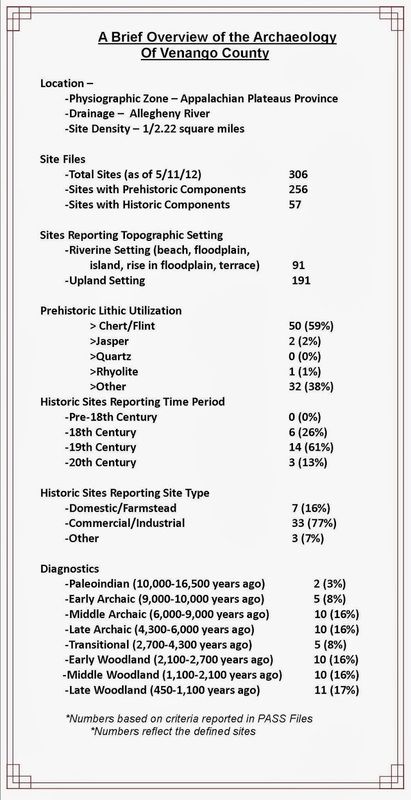 The majority of sites recorded in the Pennsylvania Archaeological Site Survey (PASS) files are located in upland settings. Two sites previously reported on in riverine settings provide important architectural information for Venago County. Three house types were identified by Sue Ann Curtis at sites 36Ve3 and 36Ve50. Type I is defined as a single circular to oval row of posts that encloses an area from 8 to 12 feet in diameter. Type II is a circular or oval structure with an attached oval storage compartment, typically 8 to 12 feet in diameter but as large as 15 to 20 feet. These oval compartments are often associated with food storage. The third house type is also circular, 8 to 12 feet in diameter, but has an inner row of post molds- essentially a double wall around all of part of a wall. It is posited that this second row may have been post supports for a bench which lined the walls of these structures. Curtis identified eleven houses at 36Ve50 and two at 36Ve3 and suggested that as many as 20 houses may be present at each of these sites based on artifact concentrations and additional post molds. 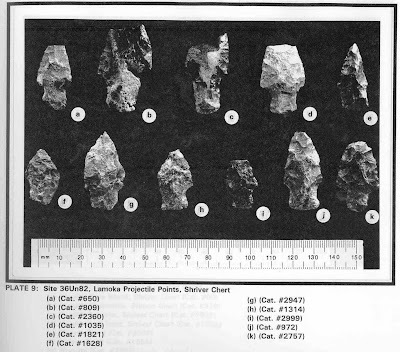 Curtis suggests that these camps are central base or transient camps based on the presence of residential structures, ceramics, projectile points and stone tools such as grinding stones, net sinkers, choppers, drills and scrapers. Pottery is described either grit or quartz tempered with shell tempered pottery present at rock shelter sites. Rock shelters were used seasonally as defined by faunal remains of turtle, frog, migratory birds and mussel shells. We would be remiss in not mentioning at this time the Rainbow Rocks Petroglyphs site. Examined and reported on by James Swauger of the Carnegie Museum, Rainbow Rocks Petroglyphs are carved on the north wall of a rockshelter opening, part of the Pottsville sandstone formation. These pecked and rubbed images illustrate snake figures, bird tracks and a single human figure. 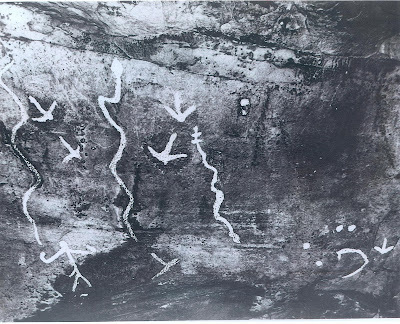 Swauger who made extensive surveys of the Ohio River Valley petroglyph formations, notes that the human figure at Rainbow Rock is a stick figure, an unusual form as others are generally full bodied in the Upper Ohio Valley. The snake and bird figures are common elements on petroglyphs located across the Commonwealth, including the lower Susquehanna River. 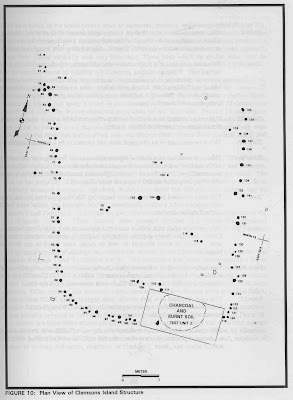 These petroglyph sites are considered specialized use sites as are a series of oil pits identified and recorded in Curtis’s survey of Venango County. 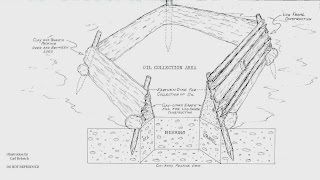 Two to three thousand oil pits have been dug along terraces in the Oil Creek Valley. These pits were present when the region was explored in the 18th century, and evidence indicates Native peoples were using them during the Middle Woodland Period (1,100 – 2,100 years ago). Foot paths used by these native groups were identified by Wallace and include the Cornplanter-Venango Path, Frankstown-Venango Path and the Venango Path. It seems likely that the presence of oil near these foot paths played a role in their importance in Native trade to the west and north. The Venango Path was not only important for native peoples, but was also an important military highway during the French & Indian War. The French construction of a portage road from Presque Isle Bay on Lake Erie, south to Waterford and Fort LeBoeuf allowed for the transport of materials to French Creek and eventually the Allegheny River. This route was important for the French who controlled the Louisiana Territory and who needed to maintain this path from Canada to Louisiana. The French fort constructed here in 1756, Fort Machault, was located at Franklin, at the junction of French Creek and the Allegheny River. The British defeated the French and built their fort at this location in 1760. It was subsequently destroyed during the Pontiac War in 1763. The Treaty of Fort Stanwix in 1784 allowed for the settlement of these lands and designated the area as “Donation Lands”. Donation lands were set aside by the commonwealth for donation to Pennsylvania veterans of the Revolutionary War as payment for service. In August of 1859 the first oil well was drilled on land owned by Edwin L. Drake, an event that would significantly impact the area. By 1862 three million barrels of oil were reportedly produced and the rush to “get rich” drew thousands to the area. Boom towns which had sprang up overnight, Boom Towns, only to become abandoned waste land. Pit Hole was one such town. Established in 1865, its population soared to 20,000 in a few months’ hotels and businesses would cover the town. Plagued by fires that occurred on an almost weekly basis and the discovery of more productive wells a few miles away, the population dropped to just 287 by 1870. Three families remained in 1877 when the borough charter was annulled. Today the Drake Well Museum and associate groups help to maintain and operate a visitor center at the site of Pit Hole. Archaeological investigations continue to explore the heritage of this region and the effort of recording many of these sites goes to the Venango Chapter #30 of the Society for Pennsylvania Archaeology. Chapter members have recorded a half- dozen sites and updated information on others, much of this done by chapter member Bill Black. This chapter is very active at the local level and often presents at the annual meetings of the Society for Pennsylvania Archaeology. Their interest in preservation and archaeological heritage are to be commended. We hope you will take some time to read about the archaeological heritage of your community and take the time to record archaeological sites that you may know about. Remember this is your heritage and it is our duty as citizens to strive to preserve the past for the future. Join us next week as we explore Warren County on the border with New York state and just north of Venango. The Cultural Ecology of Early Late Woodland, Venango County, Pennsylvania, Thesis in Anthropology, Pennsylvania State University, December, 1971. The Rainbow Rocks Petroglyphs Site, Pennsylvania Archaeologist, Bulletin of the Society for Pennsylvania Archaeology, September, 1972, V. 42, No. 3. With the Thanksgiving Holiday once again upon us TWIPA returns this week with a post focused on one of everyone’s favorite topics, food. Foodways, or subsistence strategies, have long been a topic of interest and study of anthropologist and archaeologists. By quantifying the number and types of food remains, archaeologists can determine the percentage of different types of plants and animals harvested. The State Museum of PA’s Section of Archaeology receives a steady flow of artifact collections as a result of Cultural Resource Management project surveys and excavations. A recently submitted project involving highway improvements in Montgomery and Philadelphia Counties recorded four dozen, mostly 19th Century domestic sites. As a part of the project’s phase II workplan, diet and consumer behavior were identified as potential research issues for two of the sites that were considered potentially significant. 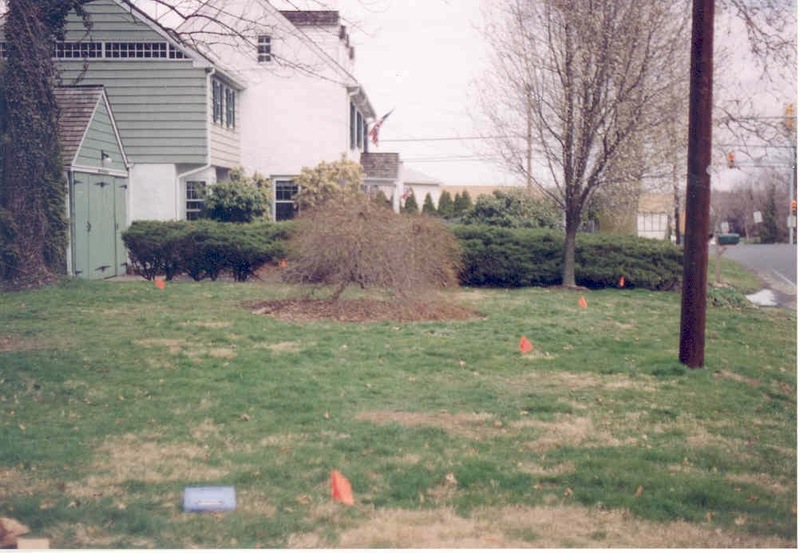 In his report to PennDoT, Gary Coppock, working at the time for Archaeological & Historical Consultants, noted, “Archaeological remains can be analyzed for indications of the patterns of purchasing and consumption of goods by site occupants. Analysis of faunal remains may show the extent to which wild or domestic animals contributed to the diet, whether the animals were slaughtered at the site, and the economic and dietary value of meats consumed by site occupants (Coleman et al. 1984). Ceramic analyses can also contribute to the understanding of food consumption habits. A comparison of the relative frequency of flatware and hollowware forms, for example, has been used to infer the quality of meats used and in what form they were consumed (Kelso 1984)." Stepping back in time, the evolution of foodways began with small populations of Paleoindian hunters and gatherers exploiting an ice age landscape. Although the quantity of foods was relatively low, human population was also low and they did not need to develop special tools or organize a labor force to support themselves. The Archaic Period represents a plentiful time and human populations quickly grew by efficiently using all available resources. People developed many new tools to maximize their collection of food from the environment. As human populations increased, they began to exhaust the foods of the temperate forest and were forced to cultivate plants. Native American social organization began to change. Humans became more sedentary and eventually focused on farming to support increasing populations. Social structure changed to a tribal organization in order to better organize the labor force necessary for swidden agriculture of corn, beans and squash, often referred to as the Three Sisters. 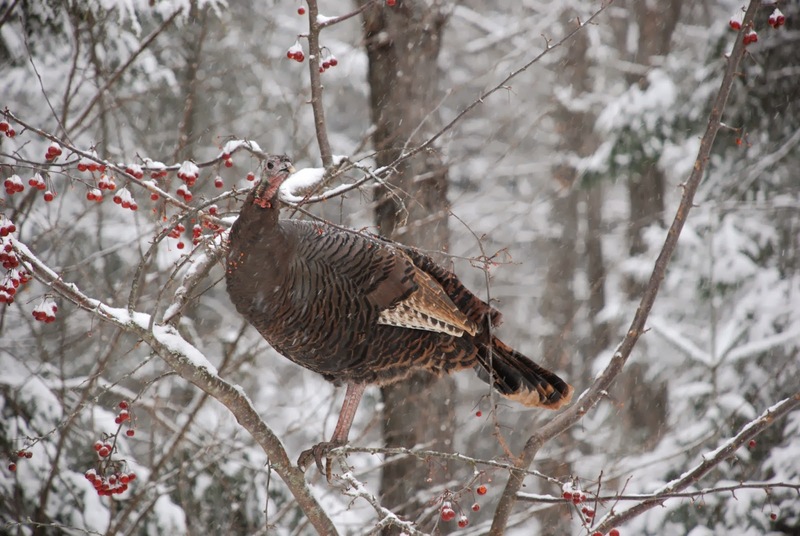 Both the nature and timing of the arrival of these domesticates into the Mid-Atlantic region continue to be intensively studied research topics in archaeology. Each of the “Sisters” arrived in the Northeast at different points in time, with squash (Cucurbita pepo) being the earliest at between 5000 and 2500 years before present (Hart and Sidell 1997). Next, corn, or maize, (Zea maize) becomes common in archaeological settings post-dating roughly 1200 B.P., or about A.D. 700 (Klein 2003). And last to appear in the archaeological record is the common bean (Phaseolus vulgaris), at approximately A.D. 1300 (Hart and Scarry 1999). The application of C-14 and AMS techniques has proved to be indispensable tools for dating these and a wide variety of other botanical remains. Requiring magnification, smaller evidence such as pollen, starch grains, and phytoliths can be used to identify plant species beyond the three typical domesticates. These types of analyses can not only help to identify dietary components of an archaeological site, but also aid more broadly in paleoenvironmental reconstruction. Along with zooarchaeological analysis of faunal remains, proteins recovered from the residue on cookware can be analyzed to identify groups of animal species and in some instances specific species. All these techniques aid the archaeologist in creating a more detailed picture of the past, in this case concerning just exactly what ingredients were used in preparation of a meal. 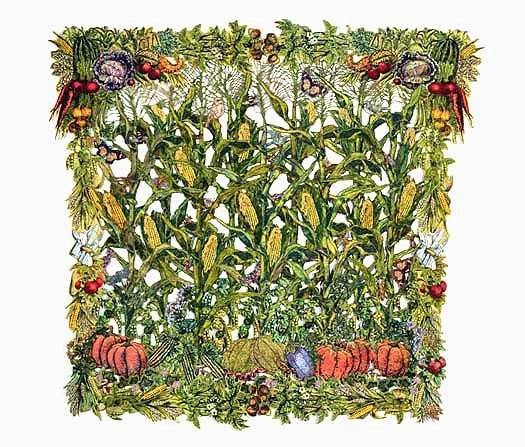 We hope this brief overview of foodways and food remains analysis wets your appetite for an enjoyable Thanksgiving meal with family and friends. 1984 Phase III Data Recovery Excavations of the William M. Hawthorn Site (7NC-E-46), New Churchman’s Road, Christiana, New Castle County, Delaware. Delaware Department of Transportation Archaeological Series No. 28, Dover. 1984 Kingsmill Plantation, 1617-1800: Archaeology of Country Life in Colonial Virginia. Academic Press, New York. If you are a frequent follower of This Week in Pennsylvania Archaeology, you would know that this past Saturday, the Section of Archaeology of the State Museum of Pennsylvania hosted its annual Workshops in Archaeology program. The theme of this year’s program was the Archaeology of a Troubled Nation 1775-1865. This all day event was comprised of a series of PowerPoint lecture presentations. Based on the Evaluation Questionnaire, this year’s program proved to be informative and entertaining for all whom attended. Noel Strattan and Tom Held of the Bureau for Historic Preservation were on hand to guide people through the inner workings of the Cultural Resource Geographic Information System, or CRGIS web portal. Doug McLearen and Kira Heinrich, also of the BHP, were available to identify all manner of historic and prehistoric artifacts that might have been puzzling their discoverers. The program was fortunate to also include Civil War reenactor John Heckman. John showcased the uniform and equipment of a common Pennsylvania soldier and fielded questions from the inquisitive. Steve Nissley, an expert flint knapper, set up a lithic tool production workshop outside of the Auditorium. Steve’s demonstration is always well received and much appreciated, as seen here by some of our younger participants. The morning began with opening remarks delivered by the Director of the State Museum of Pennsylvania, David Dunn, followed by four PowerPoint lectures focused on 18th century aspects of the workshop’s theme. Wade Catts of John Milner & Associates relayed his experience using a type of remote sensing technology called ground penetrating radar, or GPR, to aid in the search for the remains of the Continental Powder Works and gun factory at French Creek, Chester County. The complex had played an active role in the American Revolution but was ultimately destroyed during the conflict. Wade explained how East Pikeland Township has taken an active role in preserving this unique piece of American history by securing a grant from the American Battlefield Protection Program. Janet Johnson, Curator in The State Museum of Pennsylvania’ Section of Archaeology spoke about the recent discovery, subsequent local and state coordination, and ongoing conservation efforts to stabilize a Revolutionary War relic known as a Cheval de Frise. A large number of these were placed in the Delaware River to thwart the advances of the British Navy during its attack on Philadelphia. Once this impressive 30 ft. long iron tipped “river spike” is preserved and exhibited, it will serve as an effective vehicle to connect people with the events of the American Revolution that took place in and around Philadelphia. David Orr of Temple University discussed the work conducted work at Valley Forage National Historic Park. He explained how archaeological features recently discovered can transcend the well recited national historic mythologies of hardship and endurance of the winter of 1777-1778. Isolated trash pits, discrete cooking areas, and orderly arraignment of where the soldiers’ huts once stood illustrated the less well known stories of industriousness, effective leadership and disciplined training. These findings are now contributing to a greater depth of understanding of this critical point in the formation of our new nation. Steve Warfel, retired Senior Curator of Archaeology at the State Museum of Pennsylvania, presented details of Ephrata Cloister’s use as a Revolutionary War hospital during 1777 – 1778. Through his extensive excavations of now extant dormitory and prayer buildings on the National Historic Landmark property, Steve has been able to tease apart military and medicinal artifacts of the hospital period from those more domestic in nature associated with religious community members. Thorough primary document research combined with a long term archaeology program have created a more accurate portrait of the past and corrected some secondary source romanticized histories of the Cloister. Following a break for lunch, the four lectures presented in the afternoon continued with 19th Century aspects of the Workshop’s theme. Walter Rybka, Senior Captain of the Flagship Niagara, walked the audience through an hour by hour timeline of the Battle of Lake Erie in 1813, a brief yet powerful conflict on Pennsylvania’s Great Lake. He also outlined the history of a series of reconstructions made of the war vessel, including his time and experiences as Captain of the current ship. Today, the Niagara is a high caliber combination living history museum and sailing ambassador of the Commonwealth. Mary Ann Levine of Franklin and Marshal College shared her findings from excavations at the Thaddeus Stevens and Lydia Hamilton Smith site, located in the historic district of Lancaster City, Pennsylvania. A curious modification to a cistern coupled with oral histories and documentation of Stevens as a prominent abolitionist suggest this site might have been a place of refuge along the Underground Railroad. The nature of the function of such sites makes their positive identification a rare occurrence. John Roby of Indiana University of Pennsylvania offered his listeners the notion of how a nuanced social context has the potential to lead to a refined interpretation of archaeological remains. Ideas concerning social justice and resistance through conscientious consumerism were introduced through the example of the Free Sugar Movement of the mid – 19th Century. This social lens was then applied to the archaeology of a multi-generational maple sugar production farm owned by an African American family in Susquehanna County. Ben Resnick from GAI Consultants discussed the accidental discovery, analysis and re-burial with military honors of a civil war soldier who had been killed during the first hours of the battle of Gettysburg. Using battle records he was able to lay out the proceedings of the morning in the area known as the ‘railroad cut’, where the remains had been found. Forensic archaeology then made it possible to surmise a plausible end to this brave soldier’s life. Current research has narrowed the personal identification of this individual to one of about 30 candidates, and future research using DNA may be able to establish his identity. As for now he has been reburied with high honors as “Unknown Civil War Remains”. Following the final presentation, Judd Kratzer remarked on how each of the projects featured during the program had contributed to our greater understanding of the conflicts represented in the time period under discussion through archaeology field work and analysis of material culture. There was also a brief question and answer period to afford attendees the opportunity to pose specific comments or questions to the presenters.The day’s events concluded with a casual wine and cheese reception in the Archaeology gallery. We would be remiss if we did not mention and thank our dedicated group of volunteers who helped in all manner of ways, both in front of and behind the scenes. We would not be able bring this event together without your assistance. A special thanks to Judy Hawthorn who took pictures all day long of the event. Already looking ahead to next year, the Workshops in Archaeology program is scheduled for Saturday November 8th, 2014. The theme will be the Paleo-Indian time period and Ice Age peoples’ adaptations to a changing climate and environment. This week in Pennsylvania Archaeology takes us to Union County located near the heart of central Pennsylvania. In 1813 Union County was formed from part of Northumberland County allowing for a living area of 317 square miles. The 2012 the census records reports a population of 45,000 people living there and Lewisburg is the county seat. Two physiographic sections make up Union County. The eastern half is within the Susquehanna Lowlands while the western half is comprised of the hills and ridges of the Appalachian Mountains. Elevations range from a low of 938 feet in the valleys to a high of 1443 feet on the highest ridge tops. Both Sections form a large part of the Ridge and Valley Province of central Pennsylvania where the climate is temperate and largely pleasant year round. The bedrock in Union County was formed from Ordovician, Devonian and Silurian sediments (365-500 million years old). The bulk of the county’s bedrock however, is made up of the 405-430 million year old Silurian Period material. The remains of many fossilized plants and animal fauna have been found in the strata of these rocks which are among some of the finest preserved in the Commonwealth. The Faylor-Middle Creek Limestone Quarry at Winfield contains some of the best calcite, fluorite and strontianite crystal specimens that have been identified by Pennsylvania geologists (Geyer et al. 1976). 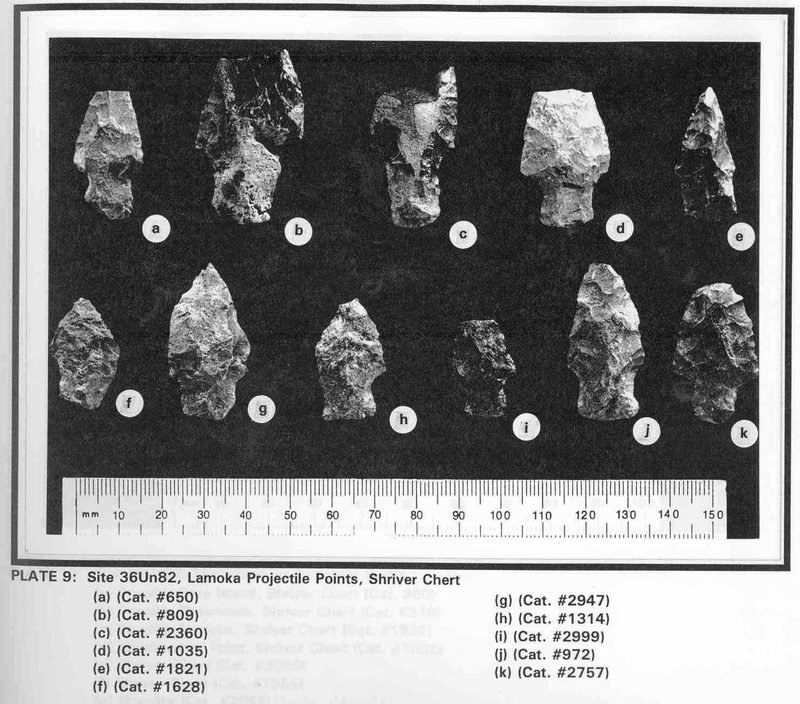 Additionally, there are massive chert bearing deposits in the Penns Creek drainage that were exploited for stone tool material by different prehistoric Indian cultures (Bressler 1960). The principal drainage of Union County is the Susquehanna’s West Branch where its tributaries are east trending. Buffalo and Penns Creek are the main secondary water sources. The former enters the West Branch at Lewisburg and the latter continues on its southern course to enter Middle Creek south of Selinsgrove, Pennsylvania. Three Indian paths ran through Union County. The Great Island Path skirted the northern part of the county and connected Great Island at Lock Haven with Shamokin at the Forks of the Susquehanna at Sunbury. An unnamed secondary path connected Great Island with the Penns Creek Path at Millheim, Pennsylvania on Penns Creek. Along the southern border of Union County ran the Penns Creek Path which also converged at the 18th century Shamokin Indiantown once located at the Forks of the Susquehanna at Sunbury. 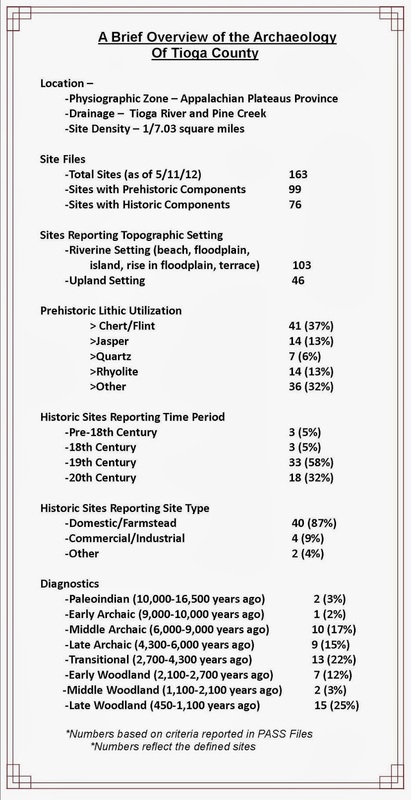 A review of the Pennsylvania Archaeological Site Survey (P.A.S.S.) files identified 142 recorded archaeological sites. Of these, 37 are Historic and the remainder are Prehistoric. Most of the Historic sites are 19th century in age, however, the reported prehistoric sites are representative of all the recognized cultural periods in Pennsylvania, from Paleoindian through the Late Woodland. In terms of site type, the majority are Late Woodland (25%) and Late Archaic (22%) in that order of frequency. Transitional sites (16%) are followed by Middle Archaic sites (14%) then Early Woodland at (7%). Next are Middle Woodland (5%) and Paleoindian sites (5%) and ending with four Early Archaic Period sites at (4%). Not unexpected, the primary choice of lithic material for tool manufacture are local source cherts from the Keyser/Shriver formations that occur in eroded outcrop and cobble locations in much of Union County. As well, open pit quarries are reported from certain sections of the county. One of the principal cultural resource data recovery projects in Union County was undertaken and completed in 1992 for U.S. Department of Justice Federal Bureau of Prisons (Wall 1995). 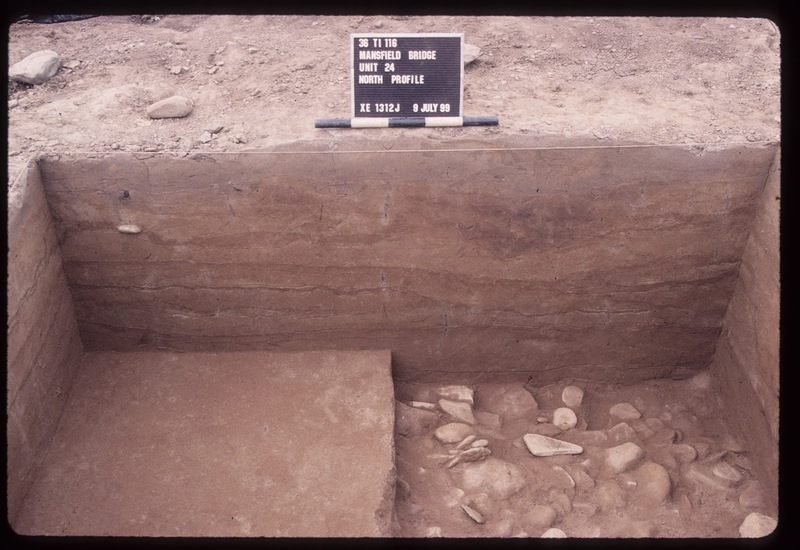 The project, located on a Holocene/Pleistocene terrace on the West Branch Susquehanna River at Allenwood, Pennsylvania, is a stratified prehistoric site. 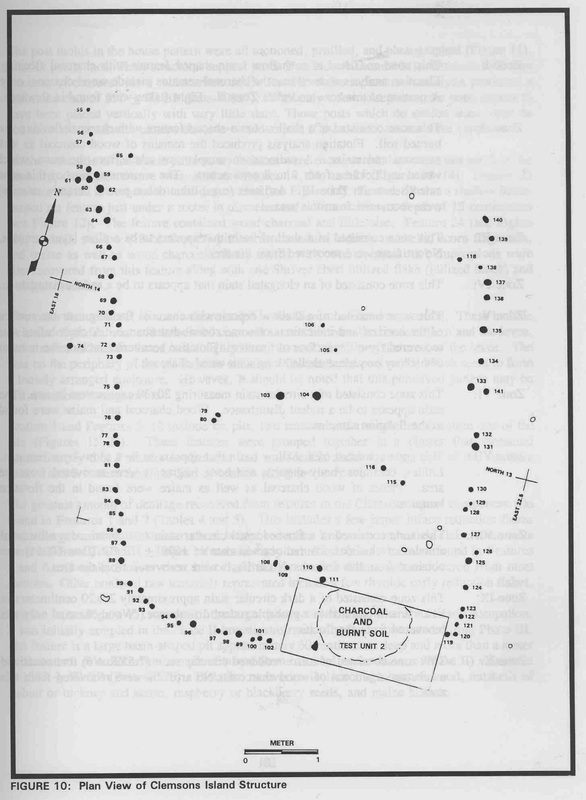 The site, designated in the PASS files as 36Un82 is multi-component with Late Archaic, Transitional (alternatively called Terminal Archaic by the investigators of the report), Early Woodland and early Late Woodland (Clemson Island) period occupations. The deepest cultural level occurring at 36Un82 is 3Ab associated with the Lamoka phase of the Late Archaic Period (Ritchie 1965; Funk 1993). Four hearth features from a living floor date the Lamoka occupation(s) between 2950 BP and 3970 BP. The 2950 B.P. radiocarbon date seems too late in time for this occupation, therefore the remaining cluster of four dates which averaged out at 3820 B.P. indicate an approximate site occupation by Lamoka phase people around 3800 B.P. The Transitional Period Broadspear phase occupation(s) was identified immediately above the Lamoka levels of 2Bwb and occasionally co-mingled with younger Early Woodland Period Fishtail and Meadowwood phase points that had apparently made their way into the deeper Broadspear phase level from the Bwb. Three radiocarbon dates from hearth contexts suggest an occupation(s) range for this component between 2900 BP and 3640 B.P., but again, by eliminating the youngest of the three dates (the 2900 date) which appears to be an outlier, an averaged date of the actual Broadspear occupation would have been around 3610 B.P. It is unfortunate that there were no radiocarbon dates linking the site’s cultural chronology in the next upper level designated as 2Ab. This was the site’s uppermost intact level containing the Fishtail phase and Meadowood phase points. However, the outlier date noted for the Late Archaic date cluster seems closer to the Early Woodland and may in fact date that occupation at 36Un82. Typically, these occupations at other Susquehanna Valley sites date between 2500 B.P. and 2200 B.P. - not that far temporally removed from the aforementioned 2900 B.P. date. The uppermost deposit at 36Un82 designated as Bwb contained pit and postmold features representative of the Late Woodland Clemson Island phase. This and its Early Owasco counterpart are the dominant cultural expressions thus far recognized for the entire West Branch valley (Turnbaugh 1977). Features of the Clemson Island phase were prolific at site 36Un82 and largely consisted of hearths, refuse and storage pits containing cultural debris such as decorated grit tempered pottery, broad based triangular points and numerous cobble tools commonly associated with lithic reduction and food preparation activities. The majority of these features are likely linked to the remains of an adjacent longhouse. Associated radiocarbon dates place the occupation between 970 and 1070 B.P. The assumed date of occupation is the average of the two dates or 1020 B.P. 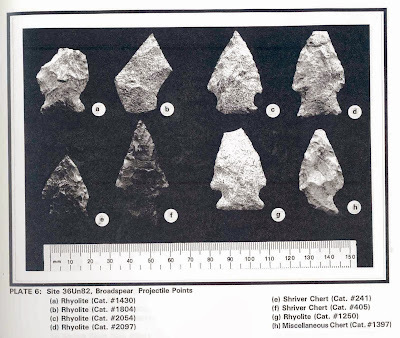 We hope that you have enjoyed this brief introduction to the archaeology of Union County and we encourage you to consult the Reference Section of this TWIPA submission for further information on Pennsylvania history and archaeology of the cultures that once lived here. The State Museum of Pennsylvania's Section of Archaeology will be hosting its Annual Workshops in Archaeology on Saturday November 16, 2013. This year's theme is the Archaeology of a Troubled Nation, 1775-1865. As always, lectures will be presented by professionals from throughout the region as well as artifact identification in the afternoon, so don't forget your "what's this". This year will also include John Heckman, a Civil War reenactor who will showcase the uniform and equipment of a common Pennsylvania soldier during the American Civil War. A reception in the Hall of Anthropology and Archaeology will conclude the event. Click here to see the brochure which includes all the details. 1960 The Penns Creek Archaic Workshops. Pennsylvania Archaeologist 30(1):25-29. 1993 Archaeological Investigations in the Upper Susquehanna Valley, New York State. Two volumes. Persimmon Press Monographs in Archaeology. 1978 Mineral Collecting In Pennsylvania. Department of Environmental Resources Topographic and Geologic Survey. Harrisburg. 1965 The Archaeology of New York State. The Natural History Press, Garden City, New York. 1977 Man, Land and Time: The Cultural Prehistory and Demographic Patterns of North-Central Pennsylvania. Unigraphic Press, Evansville, Illinois. 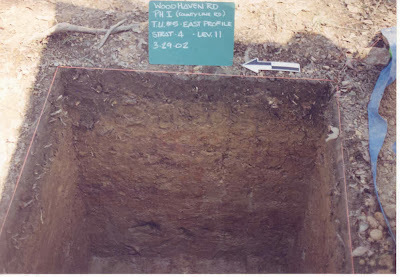 1995 Phase III Archaeological Investigations 36UN82 Union County, Pennsylvania. ER#89-1630-119. Allenwood Pennsylvania Federal Correctional Complex Sanitary Water treatment Facility. Louis Berger & Associates, Inc. Report prepared for the U.S.Department of Justice, Federal Bureau of Prisons. Washington D.C. This week in Pennsylvania Archaeology takes us to Tioga County situated at the northern border of Pennsylvania. Surrounded by Potter, Lycoming and Bradford counties and the New York state border, Tioga is noted for its many State and National parks and numerous lakes where residents and visitors alike enjoy its captivating natural beauty. Segments of the 50 mile long Pennsylvania Grand Canyon west of Wellsboro and the Pine Creek Rail Trail wind through Pine Creek gorge and connect with the Susquehanna’s West Branch River valley at Jersey Shore, Pennsylvania. Tioga County, formed from part of Lycoming County in 1804 takes it name from the Tioga River. It has a total land surface of 1137 square miles and Wellsboro is the county seat. Much of Tioga County remains rural and is the perfect setting for the State’s annual Laurel Festival held each Spring. The main corridors, 6, 287 and 15, connect much of the countryside with the more urban towns such as Mansfield, and home to Mansfield University of Pennsylvania. Pennsylvanian, Mississippian and Devonian rocks constitute the geological makeup of Tioga County and originally these rocks were a part of the vast sea sediments that formed some 290-405 million years ago. Tioga County is located in the Glaciated High Plateau, Glaciated Low Plateau and Deep Valleys Sections of the Appalachian Plateau Province. These physiographic land forms are characterized by eroded hills and generally narrow, steep sided valleys. The major streams are the Cowanesque and Tioga Rivers that form as major waterways of the Chemung and the Susquehanna’s North Branch drainage. According to Paul Wallace (1971) three major Indian paths cut through Tioga County. The Pine Creek Path which followed the gorge through the Pine Creek valley connected Quennashawakee Indiantown with the Forbidden Path at Genesee. The Tioga Path ran from French Margaret’s Town at present day Williamsport to Painted Post where it connected with the Forbidden Path. A third path branched from the Tioga Path and joined with the Horseheads Path at present day Canton then east to Towanda Indian town on the North Branch at Towanda, Pennsylvania. These paths were most certainly important trailways throughout prehistory since they all followed less rugged terrain along north to south and south to north flowing waterways. The Pennsylvania Archaeological Site Survey (P.A.S.S.) files list 163 prehistoric and historic period sites for Tioga County. Of these, the majority (99) have prehistoric components while the remaining (historic in age) constitute remnants of domestic dwellings/rural farmstead and a few commercial and industrial sites principally relating to a 19th and 20th century origin. Survey data for settlement patterns is largely riverine/lowland with 103 of the 163 of the reported sites grouping into this category. The remaining 46 sites relate to an upland setting environment where small first and second order streams dominate the landscape. Along with this data the PASS files also show an expected trend for the prehistoric utilization of cherts/flints over jasper, rhyolite and quartz simply due to the availability of these glacially derived lithics from valley terrace and stream outwash deposits. Such lithic cobble sources would have been readily quarried from these locations throughout Tioga County. The prehistoric record, as shown by the PASS data, indicates that an overwhelming number of Late Woodland, Transitional and Middle Archaic period sites outnumber sites from the other periods. This is especially puzzling given the pervasive nature of Late Archaic Period sites versus Middle Archaic Period sites reported for other parts of northern Pennsylvania and southern New York State. There has been a number of cultural resource surveys conducted in Tioga County, Pennsylvania, however, for this report, only one will be summarized here. Data recovery activities at the Mansfield Bridge Site 36TI116, by Louis Berger Group, Inc., was undertaken as the result of a proposed relocation and alignment of State Route (SR) 6015 at Canoe Camp located south of Mansfield. The study resulted in the discovery and recovery of new information pertaining to the prehistory of the Tioga River valley from the Middle Archaic period through the beginning of the Late Woodland period. The deepest human occupation level at Mansfield Bridge site contained remnants of a small camp used by Middle Archaic people. Within this level, archaeologists discovered bifurcate points, debris from manufacturing and re-sharpening these points and hammerstones made from river cobbles. Scattered amongst this debris lay poorly preserved bone fragments , likely the skeletal remains from game animals. Several small charcoal stained hearths that were also discovered yielded a radiocarbon age between 7610-8150 BP. Above the Middle Archaic level at the Mansfield Bridge Site archaeologists discovered a cultural occupation sealed in alluvium that dated to the Late Archaic Period at 5100-5400 BP. There, the projectile point forms were identified as Brewerton side-notched, a common point type found in this region of the Northeast. 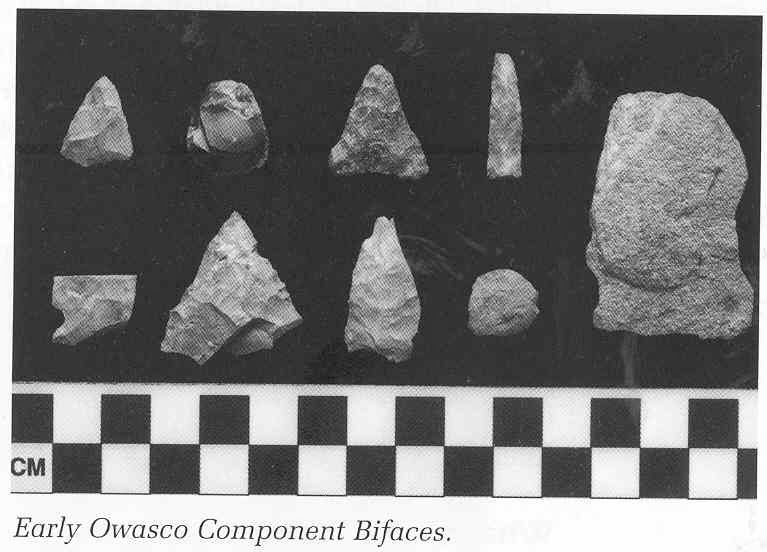 The small size of the hearths, the presence of other objects such as uniface tools, waste flakes and a cluster of cobble tools suggested a site use as a lithic workshop revisited during brief hunting and gathering excursions into the Tioga River valley. Following the Late Archaic visitations, the site was utilized as a short term camp by Transitional Period groups as was indicated by the presence of rhyolite and jasper bifaces and chipping debris of Susquehanna and Perkiomen Broad spearpoint types and hammerstones. A radiocarbon date of ca, 3500 BP., was obtained from a small hearth associated with these tools. An alluvium deposit capped these earlier non-ceramic bearing occupations at the Mansfield Bridge Site. 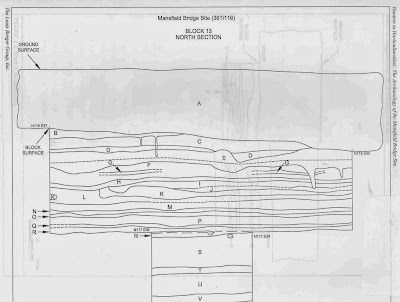 A Late Woodland Owasco phase component with a postmold pattern of a small square-shaped house 25 by 20 feet in size and pit features surrounding it were identified during the data recovery project. The occupation was radiocarbon dated to 1000 AD. 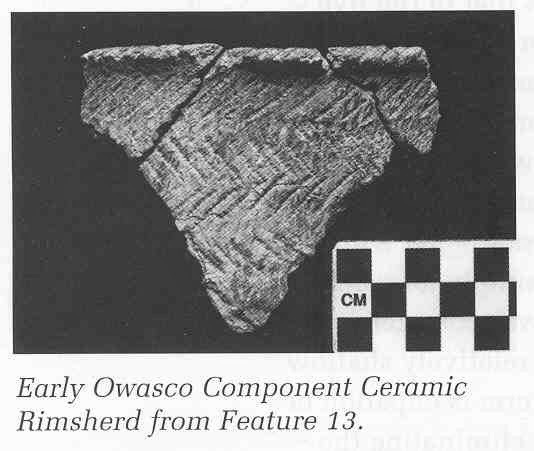 Chert triangular points, diagnostic cordmarked pottery and fragments of smoking pipes link the occupation to the earlier part of the Owasco Carpenter Brook phase (Ritchie 1965). Other sites of this phase in New York and the Susquehanna valley of Pennsylvania have been radiocarbon dated between 1000-1100 AD. We hope you have enjoyed this archaeology tour through of Tioga County and please join is next week when we will journey to Union County. The Archaeology of New York State. Natural History Press, Garden City, New York. 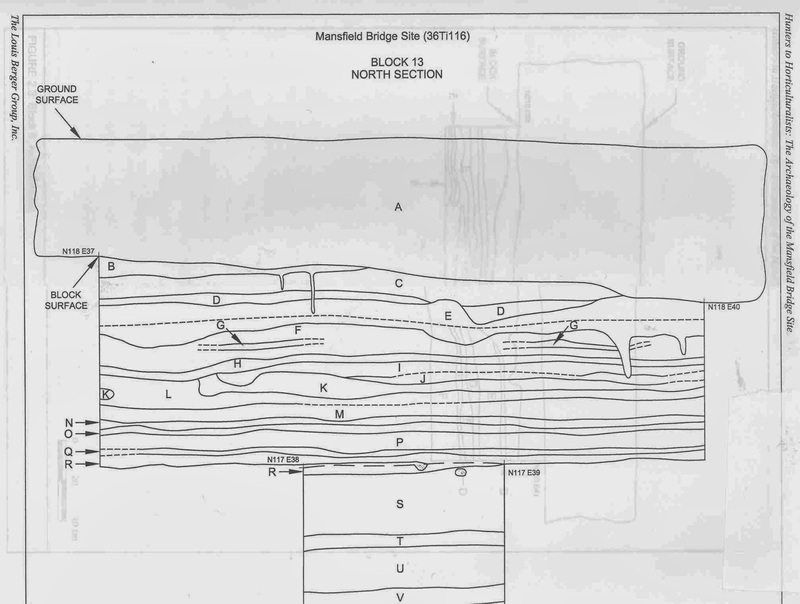 2003 Hunters to Horticulturists: The Archaeology of the Mansfield Bridge Site. SR 6015, Section D52 Tioga County, Pennsylvania. Report submitted to the Pennsylvania Department of Transportation, Engineering District 3-0, Montoursville, Pennsylvania. 1971 Indian Paths of Pennsylvania. Second Printing. The Pennsylvania Historical and Museum Commission, Harrisburg.